National Doughnut Day honors the Salvation Army “Lassies” of WWI. It is also used as a fundraiser for needy causes of the Salvation Army. The original Salvation Army Doughnut was first served by Salvation Army in 1917. During WWI, Salvation Army “lassies” were sent to the front lines of Europe. These brave volunteers made home cooked foods and provided a morale boost to the troops. Often, the doughnuts were cooked in oil inside the of the metal helmet of an American soldier. The American infantrymen were commonly called doughboys. Salvation Army lassies were the only women outside of military personnel allowed to visit the front lines. Lt. Colonel Helen Purviance is considered the Salvation Army’s “first doughnut girl”. On National Doughnut Day, look to see if your local doughnut shop, or other organizations, are offering free donuts to solicit donations for the Salvation Army or for another needy cause. If you find them, please be generous. Note: The word “Doughnut” is often shortened to “Donut. So, if you see the term National Donut Day, its the same day. The term “Doughboy” was popular in referring to U.S. Army infantryman during World War I. American foot soldiers were occasionally called doughboys during the Civil War. The earliest references to the term come from the U.S-Mexican war. 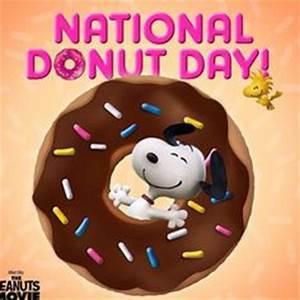 National Doughnut Day was established in 1938 by the Chicago Salvation Army to raise much-needed funds during the Great Depression, and to honor the work of World War I Salvation Army volunteers who prepared doughnuts and other foods for thousands of soldiers. Flip a Coin Day is a day when making decisions is as easy as flipping a coin. This tradition dates back to Julius Caesar. Caesar would take a coin and flip it to make decisions where the right choice was unclear. The correct answer was “heads”, which of course carried his image on the coin. Our research did not find the creator or the origin of this day. Legend has it that the creator of this day flipped a coin to determine whether he (or she) was going to document this holiday. The coin came up “tails”.